Coalition Coordinator, Gretchen Gordon, recently participated in a webinar hosted by the CIVICUS World Alliance for the launch of their report, ‘State of Civil Society 2017.’ Gordon’s presentation, based on her guest essay accompanying the report, focused on how the private sector is playing a dramatically new and expanded role in development and development finance: not just as a financier of development, but also increasingly as a development implementer and as a recipient of public development dollars. Development banks are also shifting their role – moving from directly financing projects to instead leveraging private sector investment in development. This is the new ‘Billions to Trillions’ development paradigm – that billions available in public finance will need to be utilized to leverage the trillions available from the private sector and other new investors, e.g. pension funds. This is done either by sweetening the benefits for the private investors or decreasing their investment risk. ‘Billions to Trillions’ poses critical implications for civil society and human rights. At its core, the challenge with private sector involvement in development is not the involvement itself. The critical question lies in who determines the appropriate role of the private sector? Who sets the priorities and the terms for each nation or each community’s development. Who benefits and who bears the risk? Video of the presentation can be found on the Coalition’s YouTube page, with the full webinar available from CIVICUS. 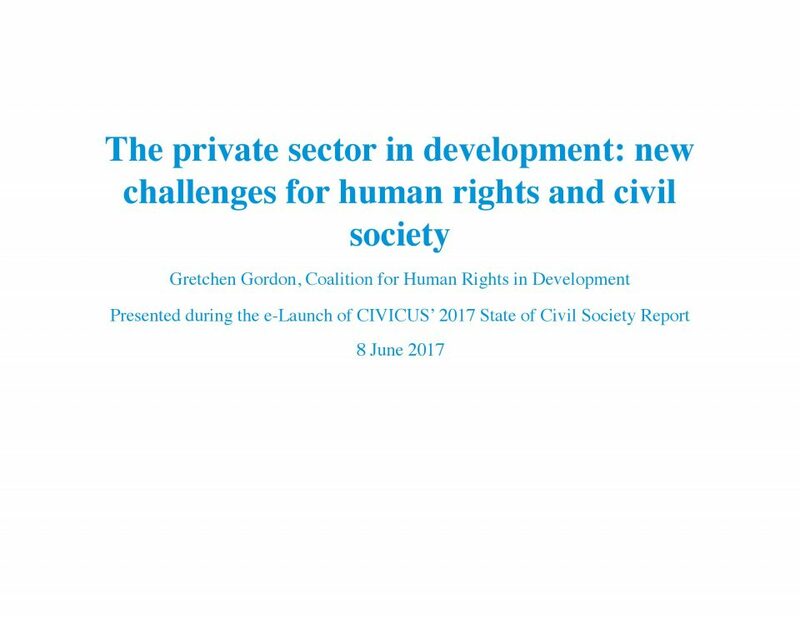 You can also read the essay, ‘The Private Sector in Development: New Challenges for Human Rights and Civil Society,’ as well as the full report.